On Friday, Spencer Pride made a big announcement on Facebook. 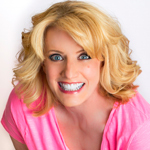 Suzanne Westenhoefer, the groundbreaking comedian, will be hosting the 2016 Spencer Pride Festival! This is major news for the rural pride event. Suzanne was the first openly lesbian comedian with an HBO Special and the first openly lesbian comedian on “Late Night with David Letterman.” Her comedy is stereotype-shattering and brutally honest. After more than 25 years since she first began as a comic, Suzanne’s visit to the Spencer Pride Festival will add yet another ‘first’ to her biography. Suzanne will be hosting the festival throughout the day alongside Spencer Pride emcee Sheryl Daniels. Suzanne will sprinkle her comedy amidst the other line-up of fantastic entertainers that will be performing on June 4th. Entertainers confirmed for this year include King Bee & The Stingers, Quarryland Men’s Chorus, Different Drummer Belly Dancers, and many more, including the infamous Ladies of Spencer Pride Drag Show. Festival organizers have been advertising this year’s event – their 10th anniversary festival – as the biggest and best ever. After reporting that their vendor registration in mid-February had more than doubled last year’s registration from the same time, this announcement about Westenhoefer certainly continues to confirm that it seems truly on pace to be the ‘biggest and best ever.’ Further signs of this year’s event being extra fabulous include confirmation this week that the family fun area will be doubled and will offer special new activities such as the a ‘toddler town’ for those under 5, a superhero-themed 5-in-1 bounce house for kids 12 & under, and a rock wall for those 13 and older. Several more activities will also help make up the Family Fun Area. As always, the Spencer Pride Festival is 100% family friendly and free. For more information about the 2016 Spencer Pride Festival, please continue to visit SpencerPride.org.